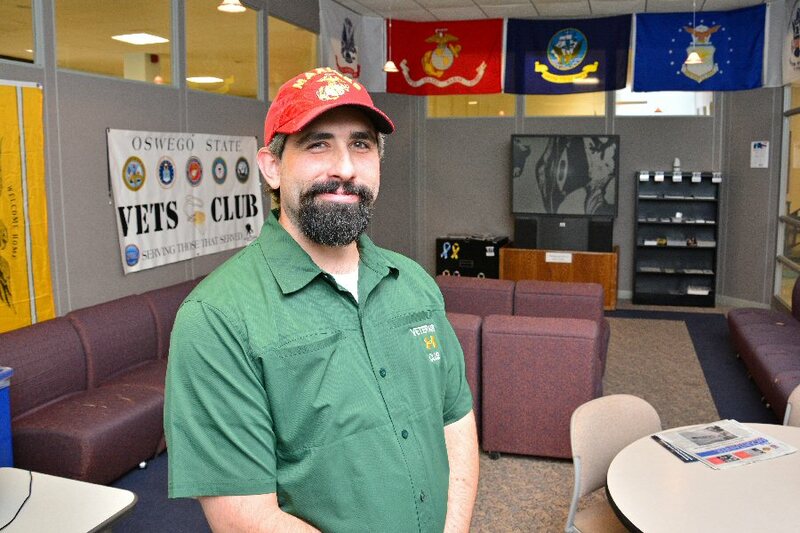 OSWEGO — SUNY Oswego has earned a spot on the 2014 Military Friendly Schools list of a veteran-owned media company, as college staff and veteran students continue a multiyear effort to improve life for the campus’ military veterans, including a newly unveiled Veterans Lounge. 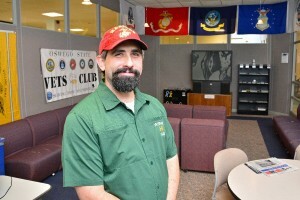 Marine Corps veteran Matt Gordon, president of the veterans club at SUNY Oswego, said he has worked with the college’s Veterans Service Office and other campus staff to help make the college more military friendly. The new Veterans Lounge in Hewitt Union is one result of the effort. SUNY Oswego was recently named to G.I. Jobs magazine’s list of Military Friendly Schools. Victory Media, publisher of G.I. Jobs magazine and dedicated to assisting military-to-civilian transition, said inclusion on its list signals Oswego’s “commitment to providing a supportive environment for military students,” according to Sean Collins, vice president of the company and a nine-year Navy Veteran. Marine Corps veteran Matt Gordon, president of a revived veterans club on campus, said he has worked with Parker and other staff members “to live up to the title” of military friendly. “It’s a work in progress, but I definitely think conditions have improved” for veterans at Oswego, he said, citing the new lounge in Hewitt Union. The glass-walled room for study and relaxation is adorned with flags of the military services, information for students dealing with veterans benefits and other issues, a television, refrigerator and coffeemaker. The most important ingredient to veterans is other vets. Keith Fosmire, a 15-year veteran of both the 10th Mountain Division infantry and the Air Force, with six deployments in Afghanistan and Iraq, said he transferred this semester from Fulton-Montgomery Community College to study software engineering at Oswego. Gordon assisted him in learning the ropes on campus, and Fosmire joined the Vets Club. Current data show nearly 60 veterans and a few active-duty military members on campus, but Parker and Gordon believe there are more. They said they worked for a programming change so that new students now have to answer questions about veteran status as they log in to the college’s computer system for the first time. The change should eventually raise the count and allow the college’s Veterans Services Office and the Vets Club to reach out to all members and former members of the military who enroll at Oswego. After a college committee in 2012 recommended a greater emphasis on resources for veterans, the college’s Division of Extended Learning hired Parker to coordinate veterans services and embark on an ambitious set of long- and short-term goals. Parker and the college have moved to conduct a needs assessment among veterans on campus; improved the veterans services website and other communication with current and potential students; and provided training for staff members who are in frequent contact with veterans. Parker and Gordon said a high priority for continued improvement is workshops for faculty who frequently encounter veteran students. Victory Media said its list of Military Friendly Schools was compiled through extensive research and a data-driven survey of more than 10,000 schools nationwide approved for VA tuition funding. Ernst & Young tested the survey independently, based on weightings and methodology established by Victory Media, the company said. The survey accords the greatest weight to military support on campus, followed by the college’s academic credibility, percentage of military students, academic credit for military service, veteran graduation rates, tuition assistance and other measures.